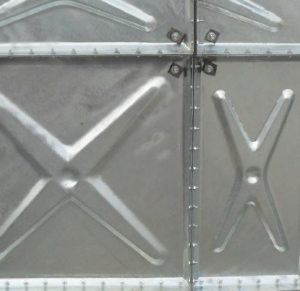 according to 02S101 rectangular water tank on atlas of a new type of steel water tank is made of Q235 steel plate manufacturing, stamping forming 1000 x 1000 and 1000 x 500 standard block, around borehole, the hot dip galvanized processing, the site for installation, assembly block between non-toxic standards on high temperature resistant rubber pad, bolt connection.Manufacture, installation is not affected by the civil construction, no welding equipment, using hot dip galvanized anti-corrosion surface treatment, beautiful and durable, prevent secondary pollution of water quality and conform to the requirements of the construction product standardization, seriation, factory. First, the whole bolt connection, the field assembly, convenient assembly, assembly when using special non-toxic sealing to seal, there will be no leakage and sealing lax phenomenon. 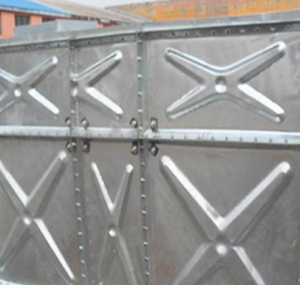 Second, the structure of the tank body particularity rod, make mechanical performance more reasonable, can reach 5 meters high.Galvanized water tank has no special requirement on installation site, without hoisting equipment, the volume can meet the requirements of all users. 2.5 mm 1 m high water tank bottom, side is 2.0 mm and 2.0 mm. 4.0 mm 4 meters high water tank bottom, side is 4.0 mm, 3.0 mm and 3.0 mm, 3.0 mm and 2.0 mm. 2, tanks should be not less than 500 mm near by?Channel, and the box at the bottom of the top is no less than 600 mm, the bottom and accessories adopt hot galvanizing.?? ???? ?Through don’t ooze water for 24 hours. galvanized well tank plate adopt through the ISO9001 quality system certification of products of Shanghai baosteel group, never is shoddy, the behavior of the damage their corporate image.Galvanized water tank sealing material are all dedicated medical glue cushion, 100 â„ƒ high temperature resistance and can reach the standard consumption.